As you may have noticed, I'm quite the nail polish addict. You'll rarely spot me without any polish on, and when I'm not wearing any it's just to give my nails a mini break. One of my favorite things to try out on my nails is each season's trendy colors. Often times I don't have the money to add a lot of trendy clothing items to my closet (like camo skinnies...*sigh*), so sometimes it's nice to still wear a trend - even if it's only on your nails! I'm loving navy this fall–great picks! I love your polish choices :) I have Essie's After School Boy Blazer and LOVE it. Now I'm eyeing the emerald, too! I love that navy Essie shade. It is so gorgeous on. I hate this but I have all of these colors not all the same brands, I;m such a nail polish addict. 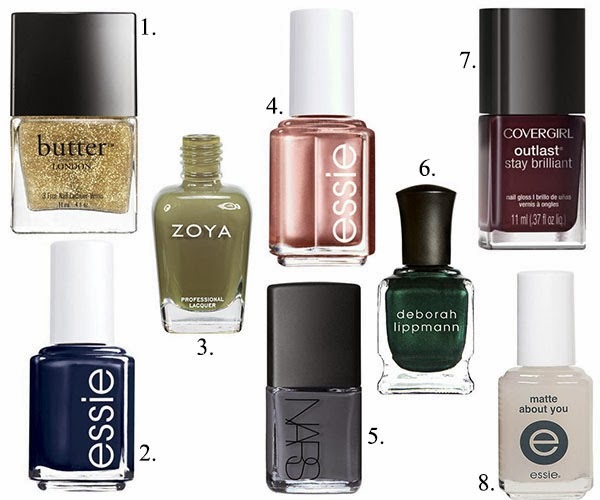 Love the glitter & gold nail polish, Jacy :) But these are all great picks!! Ooh, good picks. I'm really loving number 6. The green is so pretty and great for fall and I love that it has a little shimmer to it. I recently tried my first essie nail polish and I'm hooked now! !